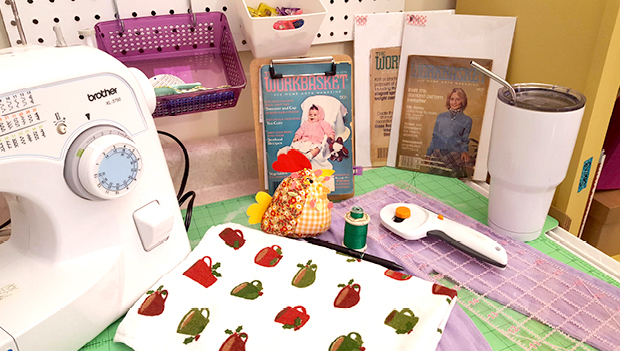 Women Who Make Cents is a department that appears in The Workbasket and Home Arts Magazine every month. It is an area where the magazine features what women across the country are doing to make money—mostly selling at church bazaars and craft fairs (there was no Etsy in 1978). This department is the early Pinterest—only back then you literally had to clip (cut) the article out of the magazine and pin/tape/paste it to a corkboard/wall/piece of paper. My thoughts: #1 Who would want to use a bedspread made of towels—sounds kinda itchy. #2 Do they still make towels with calendars on them (not to mention: why was that a thing)? Apparently, Yes and Yes. #3 Obviously, inflation* the recommended selling price would be: ~$46. My thoughts: # I actually thought about trying this…if I could find a white plate at a thrift store (I might still keep looking for one). #2 You have to have some artistic talent to hand-draw nice looking leaves/flowers. #3 Inflated* selling price: ~$31 to $38. My thoughts: #1 I love that this is an upcycling project (old glove AND metal canning lid—I have a bunch of these). #2 I don’t get how it would actually be strong enough to hold keys. #3 Inflated* selling price: ~$8. My thoughts: #1 Another upcycle project—yeah for upcycling! #2 I feel like this would just be a vessel for holding condensation from cold drinks and if not ‘shellacked’ well would get rusty. #3 Inflated* selling price: ~$5.75 to $8.00. My take & thoughts: #1 two hand towels? Were hand towels smaller in the 70’s or were brooms longer? #2 Pantyhose? Do people were pantyhose anymore? Maybe it’s just me. I were tights, pantyhose are something I purchase when I want to waste $3 because I get a hole in those things within 30 seconds of having them on. #3 Inflated* selling price: $11.50 to $14.50. Sew together two hand towels on three sides, leaving one end open. I used one kitchen towel, I purchased from a resale shop for 50¢. I used elastic from a pair of stained (and not longer fitting) kids pajama bottoms. …to use for dusting in hard-to-reach places. All in all this cost me 50¢ for the towel plus the cost of thread. So, if I thought this was something I could sell for $11.50, then an $11 profit. Not bad, but I don’t think I’m going to make another…although, I do have two children and maybe this is something they could do together! I’d probably have to purchase another broom/dustpan combo set. But that’s a small price to pay to get my kids to clean—and me not to. *Inflation was calculated at: https://westegg.com/inflation/ Inflation is calculated to 2017. I rounded up to nearest quarter or dollar.